SYNOPSIS: Set in the violent world of Victorian boxing and the honour code of the Romany Gipsies, The Dog & The Elephant is the compelling story of the unlikely kinship between young boxer Bendigo Barlow and Ina, an elephant from a travelling menagerie. Bendigo’s struggle to live with Tourette’s syndrome is made all the more difficult by fear and ignorance as he is violently shunned by those who simply don’t understand. Bendigo’s fractured life leads him on a brutal journey of destruction, retribution and ultimately revenge. 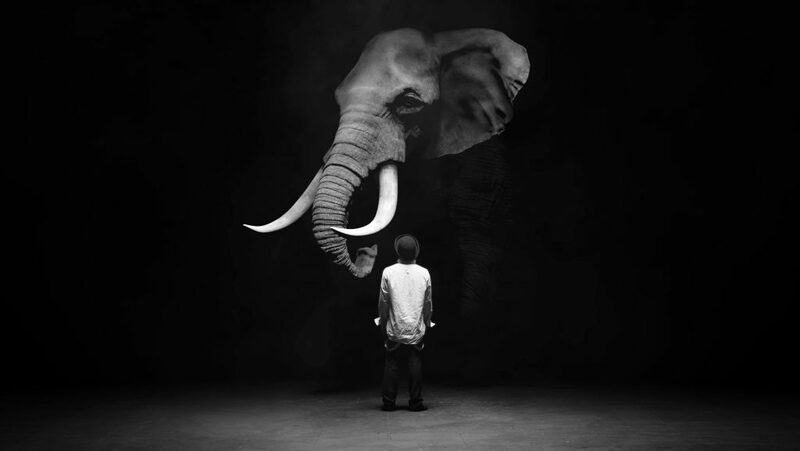 STORY: The Dog and The Elephant is an adaptation of a one-man stage play of the same name written by Matt Grinter and centres around a single tour de force by actor Jack Johns. The film was shot on an empty black sound stage with one single source light by award-winning Cinematographer Nicholas Bennett. The use of black and white photography coupled with it’s stripped back and raw visual style gives the film a cinematic quality whilst still retaining the theatre of the original play. nomination for ‘Best Video’. Mike has also created a range of diverse brand films and commercials including a 25min protest film with writer/director Richard Curtis which was projected on the side of the Tate Modern. This is his debut short film. DIRECTOR’S BIOGRAPHY: Mike started his career working for acclaimed film director Paul Weiland. He then went on to set up creative content studio Found where he has directed music videos for global artists such as Take That, Pendulum, and Cher Lloyd. In 2012 he was nominated for ‘Best New Director’ at the UKMVA’s and his music video for Ellie Goulding’s breakthrough single ‘Burn’ has earned nearly a billion views on YouTube and a Brit nomination for ‘Best Video’. Mike has also created a range of diverse brand films and commercials including a 25min protest film with writer/director Richard Curtis which was projected on the side of the Tate Modern. This is his debut short film.